You are currently browsing the category archive for the ‘Philosophy & Religion’ category. A lot of foreigners will likely not understand China’ position on this, especially Westerns. 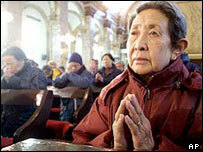 China has never had much in the way of organized religion, at least not as a Western would understand it. Historically, religious affairs; mostly Buddhist, Daoist (Tao), and Confucianism have not only been regulated by the state, but seen as appendages of the state apparatus, especially Confucianism. Many Confucian philosophers were state officials. I should emphasize that to call Confucianism and Buddhism “religions” is stretching the Western meaning a bit, due to the fact they are both”god-less”. Much of China’s philosophical history is firmly grounded in the practical application of virtue and harmony as it relates to man with the family, government, and nature. Governmental philosophy, at least since the time of Meng Zi (Mencius: 372-289 BCE) has been a mix of Chinese Legalism and state promoted Confucianism. A balance of strict, almost Machiavellian, rule of law and ritualistically enforced moral virtue. The Chinese seemed to believe that if the state is virtuous, the people will also be, which will weaken the need for laws and punishment; creating harmony. This virtue was achieved by ritual and strong bonds between a person and their family and the family and the state. If this was achieved, Kong Fuzi believed there was no need to emphasize the gods, as they will only intervene in daily life when the state lacks virtue, which will lead to disharmony “under heaven” and general “luan” (chaos). When the government could no longer maintain this balance, then it lost the “Mandate of Heaven” and would be replaced. This is a cycle in Chinese history, often a bloody one. So the Chinese government was never “by the people” but it was “for the people”, or supposed to be. That is a simplified version, but I think that gives an idea, but it is interesting to note that the Chinese came to the conclusion of “just revolution” over 1,500 before Westerns. Chinese saw it as part of the regular flow of things, seeing the world more cyclic then linear. They also seemed to be the first to come up with a proto-libertarianism, which is one interpretation of Daoism. Another interpretation would be that the virtuous end goals of Confucianism are one with Dao, so it is just a subset. All that being said, organized religions; separated from the state, often resulted in violent rebellions in China. The worst of these was the Taiping Rebellion (Great Peace Rebellion) , in the mid-19th century. Some 20 million people died. There have been similar (although less costly) rebellions of Muslims in the Western provinces as well. For this reason Chinese governments have historically been suspicious of cults, secret societies, and organized religions. These types of groups are seen as not promoting harmony, but factionalism, which will lead to instability. Western people might feel that in 2007 this is unreasonable, but they also do not live in China and rarely understand Mainland Chinese culture. I think, as China develops socially and economically there will be less fear of this sort of thing and things will liberalize. At this point the Chinese government is primarily concerned with national stability and economic development, which are deeply interconnected. Being that China has thousands of mini-uprising a year I do not believe they will do anything they feel will increase create more instability. This also explains the Chinese response to Falun Dafa (Falun Gong), which I also believe is a cult. So in the end, the concept of “separation between church and state” as in the American constitution, is very alien to Chinese culture. I believe that Taiwan and Singapore show that it does not have to be once a certain standard of development is reached. Even if there was absolute religious freedom in China, I believe the people have a cultural aversion to Western religions, as I have talked about before. Out of all the Confucian-based societies in Asia, only S.Korea has a significant amount of Christians, although all the societies have been exposed to Christianity and Islam for some time. Japan, for example, has a Christian population of less than 1% after 500 years of contact. Chinese President Hu Jintao on Wednesday reiterated a policy of free religious belief while stressing law-abiding management on religious affairs and support to self-governance of religious groups. Hu, also the general secretary of the Communist Party of China (CPC) Central Committee, made the statement at a meeting of the members of the Political Bureau of the 17th CPC Central Committee in their second study on religious issues at home and abroad. Found an interesting article on the Gene Expression ( Confucianism & China), by Razib. Not normally a big fan, but he is spot on here. He did leave out Japan though, much of their “early modern” culture was in part a fusion of traditional Shintoism and Chan (Zen) Buddhism from China and a Chinese government structure (based on Confucianism). Although Confucianism is not as strong an element in Japan it is a critical thread to modern Japanese cultural tradition. Japan like its East Asian neighbors (Chinese and Koreans) has a small Christian population, in fact the smallest, probably less than 1% of the population, despite Europeans proselytising in Japan as early as the 1500’s. I would go a little further and say that there is something intrinsic in East Asian cultures (not SEAsian) that make them very resistant to monotheistic Abrahamic religions (Judiaism, Christianity, and Islam). So Confucianism is an interesting alternative. Below I talked about the fact that even in a post-Christian continent the basic raw material of Christian belief is still abundant amongst the population which remains as a reservoir of older practices and outlooks. Is the same true of China? Though State Confucianism fell in the first decades of the 20th century as the organizing principle of the Chinese polity, the the idea of Confucianism as central to the Han Chinese identity did not really suffer major body blows until the Communist take over of the mid-20th century. While most Europeans remember a time when Christianity was ascendant as the central motivating belief structure of their culture, and some European nations still have Christianity embedded in their organizing political documents, the same is not true of Confucianism. Rather, Confucian ideas floated outside of the power structure and passed from generation to generation informally. Outside of China (e.g., Taiwan) Confucianism did not go through the gauntlet of the Cultural Revolution, so even if there was not within China some memory of this ideology it could conceivably be re-planted from without. But what exactly is “Confucianism”? The “original” Confucianism, as elaborated by Confucius himself and preserved in The Analects, was basically an elaboration of the ideals of Zhou Dynasty China. Its core, family values and traditionalism, are not particular controversial. Later on thinkers such as Mencius and Xun Zi added layers of philosophy on top of the original system, and the rise of Buddhism, and the counter reaction religious Daoism, gave birth to synthetic ideas of Neo-Confucianism, exposited effectively by intellectuals such as Zhu Xi. Some have also asserted that State Confucianism, as promulgated first by the Han Dynasty, had more in common substantively with Legalism (though Legalism was strongly influenced by one of the three fathers of Confucianism, Xun Xi), the bete noire of early Confucianism, with only stylistic flourishes being carried over from the original ideas of Confucius. Whatever the exact truth is, I think the critical overall point is that it is less important what Confucianism is, then that it served as a common anchor for the Chinese bureaucratic elite. Until recently the common anchor for the modern Chinese mandarinate were the texts of Marx & Engels, the policies of Lenin and later the thoughts of Mao (the Little Red Book was actually modeled on the Christian pocket pamphlets ubiquitous in the China of Mao’s youth). For obvious reasons that is now less appealing, and attempting to reconstruct them to be congenial to nationalist capitalism is a difficult project. Confucianism is also in some ways an odd fit, especially with its historical contempt for the merchant classes and non-primary producers in general, but at least most Chinese can accede to the fundamental value of Confucian ideas and perhaps make them relevant to the modern age.2 Just as the Constitution of the United States serves as a unifying document for the American nation, so a reconstructed Confucianism might serve as the hub around which the various spokes of Han Chinese culture revolve. 2 – One could observe that the synthesis of Christianity and capitalism which is the norm in much of modern Western culture is also rather unexpected.